Republished from a NASA press release. Olivine rain: An artist's concept of crystalline olivine rain on a developing star, inspired by the Spitzer Space Telescope. Image by NASA/JPL Caltech/University of Toledo. Tiny crystals of a green mineral called olivine are falling down like rain on a burgeoning star, according to observations from NASA's Spitzer Space Telescope. 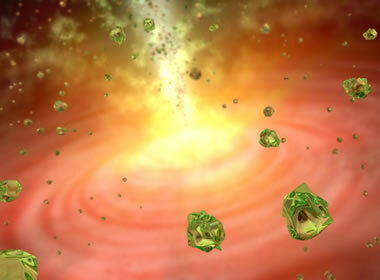 Olivine crystals: An artist's concept of how the olivine crystals are suspected to have been transported into the outer cloud around the developing star, or protostar. 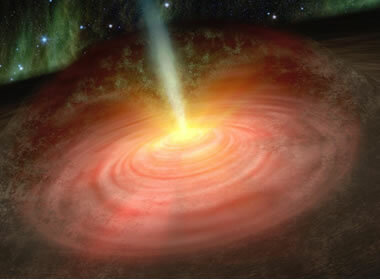 Jets shooting away from the protostar, where temperatures are hot enough to cook the crystals, are thought to have transported them to the outer cloud, where temperatures are much colder. Astronomers say the crystals rain back down onto the swirling disk of planet-forming dust circling the star. Image by NASA/JPL Caltech/University of Toledo. The crystals are in the form of forsterite. They belong to the olivine family of silicate minerals and can be found everywhere from a peridot gemstone to the green sand beaches of Hawaii to remote galaxies. NASA's Stardust and Deep Impact missions both detected the crystals in their close-up studies of comets. Olivine star: An infrared light image produced by NASA's Spitzer Space Telescope. 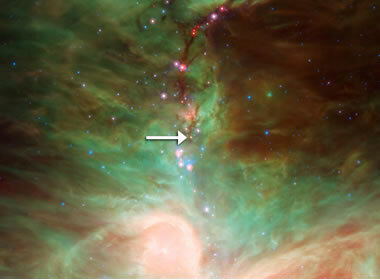 An arrow points to the embryonic star, named HOPS-68, where the olivine rain is thought to occur. Image by NASA/JPL Caltech/University of Toledo.